As a new school year begins, it is critical that students and parents take time to learn safe traveling tips. Below, the committed Knoxville auto accident attorneys at Greg Coleman Law review several ways parents and kids can stay safe during this school year. If your child suffers an injury while commuting to or from school, do not hesitate to reach out to our dedicated legal team for a free, no obligation consultation. We will fight to hold the at-fault party accountable for the pain and suffering your child has endured. With school back in session, there is likely to be an increase in both the number of vehicles on the road and the number of potential hazards for motorists. This is especially true in certain areas such as in school zones and around school busses. School zones are often heavily congested with students and vehicles at the beginning and end of each school day. Follow the reduced speed limit in school zones to avoid striking a pedestrian. Reducing your speed will also increase your reaction time and make it easier to quickly stop your vehicle if a pedestrian ends up in the road. Be extra cautious and closely look for children while you are driving through school zones, near playgrounds or public parks, and in residential areas. Come to a complete stop at crosswalks to let pedestrians and cyclists pass. Carefully look for pedestrians before making a turn near or in a school zone. Be aware of spontaneous actions from children, such as a young pedestrian or cyclist who could unexpectedly veer into your lane. Always stop for a school patrol officer or crossing guard who is holding up a stop sign. Watch out for young motorists who are inexperienced at driving. Strictly follow any rules your child’s school may have for picking up or dropping off kids in the carpool lane. Remember to only pick up and drop off your child in the designated area. Most bus-related accidents occur when a child is walking and struck by a bus or a motorist illegally passing a bus as children are exiting the vehicle. The majority of bus accident victims are children between the ages of four and seven, according to the National Safety Council. In order to minimize the threat of striking a young student, Tennessee state law requires motorists to come to a complete stop upon approaching a school bus that has stopped and activated its flashing lights and extended stop sign to indicate the bus is receiving or unloading students. Motorists cannot proceed driving until the school bus has resumed driving or have been signaled by the school bus’s driver to proceed or the bus’s visual signals are no longer activated. Many children who live near a school often choose to walk to school rather than travel in a bus or their parent’s vehicle. However, this could also be dangerous if your child is unprepared for potential hazards or dangerous motorists that might be in the area. Before the school year begins, do a practice run with your child of the route he or she will take to learn the time it takes to arrive to and from school. Tell your child to stay on the route you practiced and to avoid taking shortcuts through railroad tracks, neighbors’ yards or other areas that might be dangerous. If you are unable to accompany your child during his or her commute to school, consider having an older sibling or trusted adult walk with him or her. Teach your child to remain focused and never play roughly with another child, especially in the street. Make sure your child is always visible to vehicles by wearing bright and reflective clothing. Make sure your child is always aware of his or her surroundings by keeping a lookout for potential hazards and passing vehicles. Inform your child of the “left, right, left” technique when crossing a street by looking left, then right and then left again for any approaching vehicles. Teach your child the meaning of traffic signs and explain the importance of following these rules. You should also review the crossing guard’s signals to know when he or she can safely cross a street. Biking is a fun and healthy form of transportation for children to commute to school. However, bikes do not provide any form of protection and riders are vulnerable to severe injuries or death in the event of an accident. Know the route your child will take to school by biking with him or her before the school year begins. You should teach your child to follow the same route every day and to avoid any dangerous areas in his or her path. Encourage your child to wear reflective features on his or her clothing, including a reflective backpack, vest or straps on his or her legs or shoes. Make sure your child’s shoes are either Velcro or that the shoelaces are tied tightly. This may help prevent a bike accident caused by loose shoe strings getting caught in the bike’s chain. Teach your child to regularly inspect his or her bike to make sure it is in good riding condition. This includes regularly checking the tires’ air pressure, making sure the brakes are working properly, and inspecting the chain to make sure it is not loose. Teach your child to always wear a helmet and any other safety gear that you feel are necessary, such as elbow or knee pads. Inform your child of the importance of always being alert while riding a bike.This means he or she should never have headphones on or use a cellphone while riding a bike, especially on roads with heavy traffic. Teach your child to always come to a complete stop to inspect the path before crossing a street or making a turn. Although you may do everything possible to ensure your child travels to and from school without harm, safety is never guaranteed. If your child has been injured in an accident, our attorneys are ready to help. 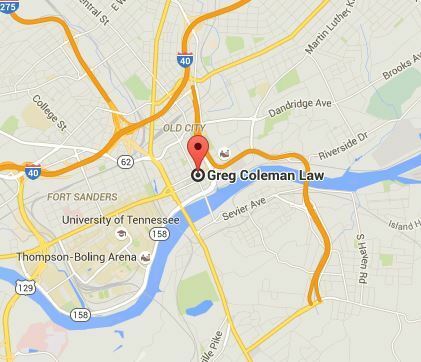 At Greg Coleman Law, our team of dedicated Knoxville personal injury attorneys understand the time following an accident involving a young child is hard on families, which is why we never charge upfront legal fees. All of our accomplished attorneys work on a contingency fee basis, which means we will only get paid if we help you recover compensation for your claim. Call (865) 247-0080 today to schedule a free, confidential consultation.